Snowbombing is a popular ski resort festival,run since 2000.The event has a reputation for its imaginative and humorous elements; traditional Austrian cultural references are embraced (e.g. oompah bands, lederhosen and sausages) and given a contemporary/surreal twist. Unconventional clothing is encouraged in a series of fancy dress themes which are adhered to by many attendees (aka ‘Snowbombers’) and cult celebrities like Mr. Motivator are engaged to entertain and interact with the crowd. Here you can see some of the world’s most remarkable live music venues and party spots. You’ll discover world class artists in one-of-a-kind settings, from a sky high igloo, to an enchanted forest, to Austria’s largest fancy dress bash. Europe’s largest outdoor fancy dress street party… It’s one of the most anticipated moments of the week (or the year), bringing together Snowbombers and local residents alike, for a wild, anarchic shindig right in the centre of the ‘hof! 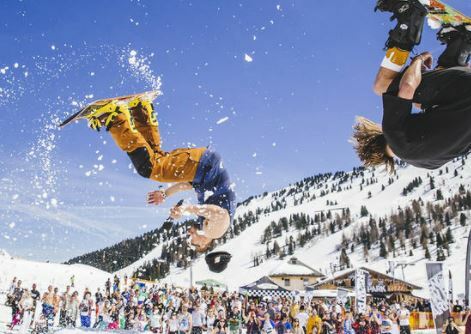 With around fifty pools and saunas within easy reach, and a backdrop of breathtaking alpine scenery, Snowbombing regards itself as a festival which, in addition to music, additionally offers luxury and comfort.[who?] European television channels and radio broadcasters have covered the event, including BBC Radio 1, Channel 4, Eurosport, Canal+ and MTV Europe. Mayrhofen enables us to put on parties in some of the world’s most unique venues. Zero mud, 5* hotels, spas & pop-up parties, plus pinch yourself moments across igloos, forest raves, open air street bashes and so much more magic amongst the mountains… It simply needs to be seen to be believed! If you want to be right in the centre of the Mayrhofen, at the eye of the storm or even overlooking the Street Party from your bedroom window, then Bang In Town is the right place for you. Grab one quick, before they’re gone! Expect luxury without the price tag, as our Downtown options allow you to save those all important pennies, giving your more cash to splash on the fun and games… And fear not, you’ll never be far from the action in the Mayrhofen Districts! Found just outside of Mayrhofen, you’re only ever a short bus ride from the action with these Zillertal Valley options. From bang-for-your-buck guest houses to the tranquil luxury of 4* spas, there are some real belters!